Plant breeding is important to ensure that crops are well adapted to the environment in which they are grown and capable of resisting harmful pests and diseases, particularly if the use of fungicides and pesticides is to be reduced to protect the envi‐ ronment and improve sustainability. However, mainstream plant breeding methods can result in genetic monocultures that are susceptible to pests and diseases overcoming their resistance, and some breeding technologies such as GM are not accepted in organic farming. The focus of our breeding programme is on increasing genetic diversity to produce crops that are more resilient to variations in climate and weather conditions; to weed, pest and disease pressures; and to other challenges. This can be achieved through the use of variety mixtures or composite cross populations with very high genetic diversity. As most modern varieties have been selected for high use of inputs not permitted in organic farming, we also aim to develop crop varieties specifically suited to organic production, e.g. which incorporate traits such as lower nitrogen requirements and higher competitive ability with weeds. Exploiting diversity is at the heart of this programme and is embedded in the different projects that make it up. The SOLIBAM project was important in developing our thinking in this area, in particular how breeding and crop management can be integrated to produce a more sustainable food system. The process undertaken to elaborate the 10 SOLIBAM key concepts - cultivating diversity has had an impact both in our own work and at an EU level, with many of the principles now being seen in the EU Horizon 2020 research programme. We looked at novel ways to exploit crop diversity in the SOLIBAM trials, assessing newly created diversity which has brought together genomes for which there was no previous known record, and combining different levels of genetic diversity simultaneously by physically mixing pure lines with composite cross populations (CCPs) and growing them together in an attempt to maximise the benefits of both. The COBRA project has developed another approach to using CCPs by using them as a ‘breeding pool’ to select individual lines that show certain desirable characteristics for organic production, e.g. traits linked with weed suppressive ability or other benefits. Lines selected have then been physically mixed and are currently grown to determine their potential as a ‘new and improved’ mixture for organic arable production. Bottom‐up participatory approaches to breeding on‐farm are also an important facet of our research activities. We have engaged in this through Duchy Future Farming (now Innovative Farmers) field labs and these are on‐going. 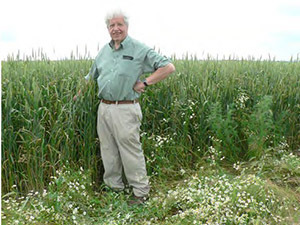 For example, winter wheat lines selected by farmers at a field lab at Shimpling Park Farm in Suffolk have been re‐sown, and were evaluated as part of the OF&G National Organic Combinable Crops event in 2015 with considerable interest from the farmers present. Our experience with breeding the populations was also used by researchers at the University of Leeds as an innovation model for their Cultivating Innovation project. Our role in the WHEALBI project involves developing concepts established in SOLIBAM regarding diversity‐based breeding goals for organic cropping systems. Through data from our field trials, we are contributing to a model designed to assess the effects of site, season and climate change in wheat production, and expected to enable assessment of wheat performance under organic conditions. In separate work on oats, the QUOATS project focusing on how new oat genetics perform in organic systems was completed in 2014. The conclusions were that weed competition was more important than disease, and that early establishment is important in weed competition (rather than later canopy cover or crop height). We found that organic yields cannot easily be predicted by conventional recommended list data and that grain quality is more influenced by variety choice than crop management. Therefore, variety choice should be based on weed competitiveness and grain quality rather than yield. In March 2014, this led to the EC agreeing to an experiment that allows the limited marketing of wheat, oats, barley and maize populations within the EU until 2018. The UK officials are coordinating this on behalf of the EU and ORC is working with commercial partners to bulk up our winter wheat population seed for sale from autumn 2016. We have named the seed ‘ORC Wakelyns Population’ in honour of the site and the people who were most closely involved with its production. ORC and our commercial partners are likely to be the first to bring this exciting innovation to market in the EU. We are working closely with our EU partners (particularly in Denmark, the Netherlands and France) so that we can all learn from each other’s marketing activities to make this experiment a success. Wheat and barley Legacy for Breeding Improvement (WHEALBI) EU FP 7 The aim of the WHEALBI project is to apply genomic, genetic and agronomic approaches to improve European wheat and barley production in competitive and sustainable cropping systems. Coordinating organic plant breeding activities for diversity (COBRA) Core Organic/Defra COBRA involves 41 partners from 18 European countries which will focus on coordinating, linking and expanding on-going organic breeding activities in cereals and grain legumes across Europe, drawing together experts from previously fragmented areas. Strategies for Organic and Low-input Integrated Breeding and Management (SOLIBAM) EU FP7 Develop specific and novel breeding approaches integrated with management practices to improve performance, quality, sustainability and stability of crops adapted to organic and low-input systems in Europe and small-scale farms in Africa. Harnessing new technologies for sustainable oat production and utilization (QUOATS) Defra, BBSRC This project integrates various breeding and selection methods with high throughput analysis of grain composition to develop oats varieties for human consumption, livestock production and industrial uses. Adaptive winter wheat populations: development, genetic characterisation and application Defra We study the yield, quality, and stability of wheat Composite Cross Populations (CCPs) under high and low input over a range of environments through phenotypic and genotypic analyses and develop the processing capabilities of CCPs for various end users. Micro-evolution in wheat German Academic Exchange Service Evolutionary changes in three wheat composite cross populations under natural selection in Germany and the UK. Funded by the German Academic Exchange Service. In collaboration with the University of Kassel, Germany. Duration July 2010-December 2010. Further cereal projects ORC Various pilot trials on spring wheat, Einkorn and barley. Funded by The Organic Research Centre. Wheat Breeding (AR914) DEFRA Generating and evaluating a novel genetic resource in wheat in diverse environments. Funded by Defra. Duration: November 2001 - April 2008. In collaboration with John Innes Centre. Additional pdfs available: Stability in wheat populations; Publication on parent varieties used in breeding populations. Oat LINK DEFRA and industry partners The incorporation of important traits underlying sustainable development of the oat crop through combining 'conventional' phenotypic selection with molecular marker technologies. 2004-2009. Funded by Defra and industry partners. Döring, Thomas F.; Howlett, S. A.; Winkler, Louisa and Wolfe, Martin (Eds.) (2013) International Symposium on Evolutionary Breeding in Cereals . The Organic Research Centre, Hamstead Marshall, UK, 22 pp. Østergård H, Finckh MR, Fontaine L, Goldringer I, Hoad S P, Kristensen K, Lammerts van Bueren E, Mascher F, Munk L, Wolfe MS (2009) Time for a shift in crop production: embracing complexity through diversity at all levels. Journal of the Science of Food and Agriculture 89: 1439-1445. Döring T F, Wolfe M (2009) Stabilising wheat yields – can genetic diversity increase reliability of wheat performance? The Arable Group Research Bulletin 22: 10-11. Wolfe MS, Baresel J P, Desclaux D, Goldringer I, Hoad S, Kovacs G, Löschenberger F, Miedaner T, Østergård H, Lammerts van Bueren E T (2008) Developments in breeding cereals for organic agriculture. Euphytica 163:323-346. Finckh MR, Wolfe MS (2006) Diversification strategies. In: The Epidemiology of Plant Diseases (ed. Cooke, B.M., Jones, D.G., Kaye B. ), Springer, Berlin. Phillips SL, Wolfe MS (2005) Evolutionary plant breeding for low input systems. Journal of Agricultural Science 143: 245-254. Wolfe M S (2000) Crop strength through diversity. Nature 406: 681-682.